Need more energy in your small home office? Or maybe a soothing nature scene for a chaotic entryway? There are many ways to bring great feng shui energy into your home; the use of powerful images being the easiest way to shift the energy of any space. Here are 15 beautiful wall murals to help you bring good, uplifting energy into your home or office. Which one will make it to your home? Wish you were living in a penthouse with breathtaking views? Now you can easily afford it with this beautiful mural! Excellent for North, West or Northwest bagua areas of your space. Excellent energy - fresh, vibrant, potent - to energize your home or office, especially the East or Southeast bagua areas. Beautiful mural with a serene sense of calm and quiet happiness, it extends the space and brings the energy of new beginnings. Excellent for East and Southeast bagua areas. Beautiful mural to help you pretend you've got the best views in the Big Apple! Excellent feng shui energy for the North bagua area. Bring the grounding and warm energy of the Earth feng shui element with this creative mural. Excellent for Southwest, West, Northwest or Northeast bagua areas. 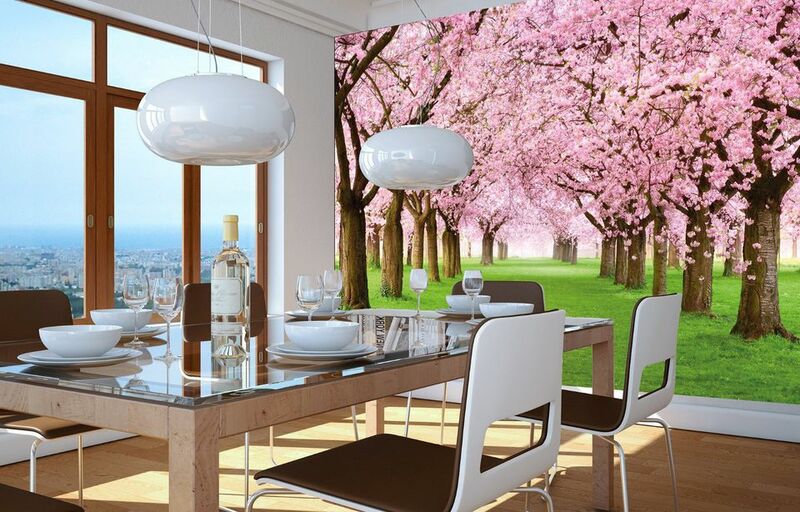 This stunning mural with the exuberant energy of spring brings the energy of love and romance into your home. Excellent for the Southwest Bagua area, as well as East, South or Southeast. A creative touch of the Wood feng shui element with a bit of warm Fire energy. Excellent for the South area of your home. Lovely mural to open up a blocking wall or bring more energy to a space with no windows. Excellent feng shui for the East, Southeast or North bagua areas. Stunning mural to bring a fresh and never-ending flow of happiness into your home. Really, can you feel anything else but happiness while looking at this mural? Excellent feng shui for the North bagua area, as well as East and Southeast. This mural brings the healing energy of the Wood feng shui element into your home, excellent for the East and Southeast areas. It is also good for the South bagua area. Another beautiful mural with the Wood feng shui element that is excellent for the East, Southeast or South bagua areas. Yet another stunning mural to treat your home or office; excellent for the East or Southeast bagua areas. Bring the soothing energies of the Wood and Water feng shui elements with this calm, yet vibrant energy mural. Excellent feng shui for the East and Southeast bagua areas of your home or office. Mountains represents stability, protection, a higher level of consciousness, as well as good backing in feng shui. The symbol of the mountain is considered an ideal image to have behind your back in your office. Relaxing, luxurious and happy, this mural is excellent for East, Southeast or North Bagua areas of your home. An instant vacation and constant happiness, this mural promises it all!